The finer details of the Budget will be worked on this weekend. 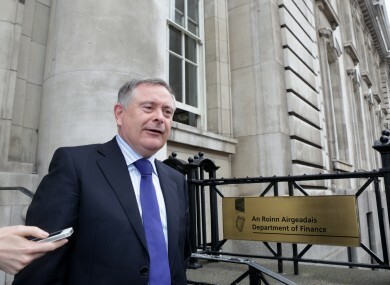 Brendan Howlin will be hammering out the Budget details with his staff this weekend. STAFF WORKING AT the Department of Public Expenditure and Reform have been told they will be needed in the office all weekend as the finishing touches are put to Budget 2014. While staff at the newest government department were on call last weekend they have been told they will be needed in the office all weekend as the Cabinet meets on Sunday to finalise the budget measures. While taxation proposals put forward by Finance Minister Michael Noonan are likely to be more easily worked through discussions over spending in the areas of social protection and particularly health are likely to go down to the wire. No agreement was reached on the health budget at Friday’s meeting which means more talks are scheduled. A source said that any decision made at the Cabinet meeting on Sunday will have to be accounted for in the Budget documentation which means staff will be there until whatever time the books are balanced. Email “The long weekend: Finance staff in the office today and tomorrow as Budget finalised ”. Feedback on “The long weekend: Finance staff in the office today and tomorrow as Budget finalised ”.